The Learning Cycle was originated by Robert Karplus in the Science Curriculum Improvement Study (SCIS) This approach has a widespread applicability and has been used as an instructional process in mathematics, language arts, and social studies texts as well as science. 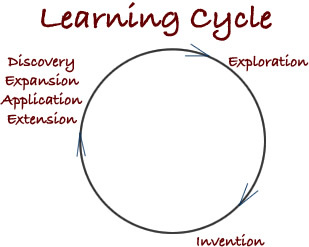 The Learning Cycle includes three stages: exploration, invention, and discovery. The exploration stage is where students' attention is focused on what is to be learned. They begin to explore materials or ideas to begin to relate their memories to the present situation. This exploration presents conditions that encourage students to use their current accurate or inaccurate understandings (concepts or misconceptions) they have previously conceptualized. As students explore they connect their past understanding to their current explorations. Piaget called this assimilation. As the student interprets the present event with their current understanding they may experience a discrepancy between their past experiences and the information they are currently exploring. Piaget called this disequilibration. This state of confusion, disequilibration, motivates the student to manipulate the materials and/or ideas to create a new schema, accommodation, for understanding and returning the student to a state of equilibration. What the student learns, or the concept conceptualized by the student, may be classified in a number of ways: as generative knowledge (subject matter knowledge), process knowledge, an attitude about the subject; the person them self; another person; society; or a culture, a concept related to the perspective of the subject, or any combination of these. In the invention stage, the teacher begins by inviting the student to share their experiences during their explorations. These experiences may be a review of their previous understandings, confusion or questioning their understandings, or a newly constructed understanding sparked by the exploration. In the invention stage, the teacher begins by inviting the student to share data they have collected. As students share their exploration experiences, they communicate their personal interpretations of their exploration. This communication can be presented in a variety of ways (oral, written in words or visual representation, acted out, sung, or any combination) for each concept. The use of the term, invention stage, is another way of stating that the students are inventing a concept and through the sharing of their collective explorations they will refine their understandings by trying to connect their experiences and understandings with other persons experiences and understandings. The teacher asks probing questions to facilitate this exchange of information and introduces vocabulary as necessary. Students are encouraged by the teacher to organize the data and to invent methods for expressing concluding statements or a visualization. The author defines visualizations as a picture, diagram chart, or graph that enables the learner to explain their interpretation of their exploration. The process of communicating the students cognitive ideas are crucial at this particular stage. The student must be able to recognize an interpretation for the data examined, to organize a logical presentation of evidence that lends itself to be understood by others, and to communicate in both a positive social and affective setting information about a particular area and the processes in creating that information. In the discovery stage, the teacher and / or students implement an activity to extend or apply the understanding from the previous stages. In the discovery stage, the teacher and / or students use the idea that has been invented and extend or apply their understanding with other ideas or in different situations. The extension of understanding by combining or joining concepts with concepts makes more complex understandings (generalization). The discovery phase is the last phase of the Learning Cycle; however, it is also the first phase of the Learning Cycle. It is in this phase that the next exploration phase may be initiated and many times will be recognized as exploration. Using the Learning Cycle as an instructional process requires the educator to be cognizant of the interplay between the instructional process, a learning theory, and the students conceptualization of concepts. Assessment is the collection of data. It is the measurement activities educators use to attempt to make valid inferences about students' knowledge, skills, and dispositions; as well as using those measurements and inferences to decide curricular aims, instructional strategies that are developmentally and academically appropriate, and if an instructional sequence was successful. The author asserts that the assessment process used in the Learning Cycle is an on-going process used by the teacher and student to check what students know and how well they know it. The initial check of what students know (diagnosis) and how well they know it is done during the exploration. It is at this time that the teacher and students may want to adjust the exploration task for the entire class or for individual students depending on the information from the teachers probing. They should be alert to assess concepts and not isolated pieces of information that alone do not suggest understanding of relationships of facts and/or concepts. Assessment continues during the exploration and invention with assessment at the conclusion of invention for generalization. While the format of all assessment is to ask questions or pose problems to challenge the students observations and reasoning, the questions or problems poised at the end of the invention allow students to extend or generalize with the newly conceptualized concept. This gives students an opportunity to use the concept in new ways to solve a problem or answer a question and the teacher the opportunity to see how well the students can generalize the concept. This assessment is different than a discovery activity in that the questions or problems are short in duration and the quality of the answers is based on the use of the concept invented in a logical way more than the answers accuracy. However, this assessment may many times lead into or be used to create the discovery activity. (1)	Assessment information can be collected from student created records of events, procedures, or random thoughts. It is imperative that the classroom teacher examine these records on a regular basis. Young children can draw their observations. As they learn to write, they can label and then write the descriptions of what they have done. As their ability to read and write matures, they can be given written focus questions to focus their attention on information they will need to know. Answers to these written focus questions are used to assess students understandings. (2)	Information collected on what students know can be inferred from their written observations and notes on focus questions or otherperformance tasks or recorded on video tape as students work. (3)	Information should include how students use concepts recently learned to make generalizations to extend what they have learned beyond their recent experiences. (4) Assessment should include developmentally appropriate tasks where students can learn and apply the content processes in a systematic manner in their everyday activities. As students work on everyday tasks information on how they inquire and solve problems must be collected to assess student growth in the use of these processes. (5)	Information must be collected on students use of process skills beyond simple understandings. Such as - How many centimeters in a meter?) Understanding beyond such as - You measured the room with your feet. The class agreed on a standard straw as a unit of measurement. Why did you choose to use feet? And - Would green bean seeds be a good choice for a standard unit? Why? or Why not? And How could you use a broken ruler to measure a shelf? (6)	Information collected should be comprehensive. Information should include categorizes - knowledge, process, disposition (habits of mind or affective), perspective, personal, and social. (7) Information collected needs to be longitudinal to have a reference for student progress as individuals and groups. (7) Information collected can be related to criteria and norm references. Learning cycle mirrors a constructivist learning theory. If the learner is going to construct scientifically accurate concepts, they must be involved in an exploration of information that will support the information they want to learn. This is achieved in the exploration stage. The Learning Cycle is an instructional process that facilitates learning by providing opportunities to the student to explore by beginning with their personal ideas rather than someone elses idea that they may not be ready to accept. The teacher helps organize experiences that will encourage students to push their personal ideas to discover their limitations. As they do so they will discover the quality of their ideas. Sometimes making minor adjustments and other times discarding their ideas and replacing them with better. For teachers to create this kind of learning experience it is important for them to understand the concepts students are to learn, the information required to conceptualize the concepts, and activities that can be explored that make this information available for students understanding. For teachers to provide students with meaningful experiences they must have a certain amount of information available to them. This information and its organization will be referred to as an organizational framework. Outstanding teachers have an organizational framework in mind if not on paper. To help teacher-educators plan and facilitate learning the author has created an organizational framework. This framework has as its major areas: Concepts for students to conceptualize, supporting information for the concepts, possible student misconceptions, assessment, activities, materials, and procedures. A description of each area of the framework, a framework outline, and a completed framework, or lesson plan, follows. Concepts are the major ideas to be conceptualized by the students over a period of time. The teacher must (1) know what concepts that are developmentally appropriate for students to learn, (2) formulate a concise statement for each concept explored. and (3) Unpack all the necessary and sufficient information needed for the students to construct the concept. The teacher should remember that concepts are the ideas about a particular phenomenon students construct from a learning experience. A concept, then, is what the students will have in their heads when they walk out of the classroom. Concepts can be classified in a number of areas. These areas are identified in national and state standards through the learned societies and need to be selected by communities as part of the school curriculum. Some possible categories are included for a frame of reference. The reader is encouraged to explore different classification systems to meet their students needs. Content Knowledge. The concepts that are information created in the topic area that include the areas subject knowledge. Process. The knowledge needed to collect data, organize data, and create information in a topic area. Dispositions. The attitudes people have who desire to use the topic area for a particular purpose. Perspective. The understanding of how a topic area developed and how it has been, is, or could be used by society. Personal. The understanding of ones abilities for self-improvement. Social. The understanding of how to interact with people for the good of the person and group. create a possible bridge using the information collected about the idea to the understanding (concept or generaliztion). communicate it clearly to someone else.